Easter is right around the corner! It’s late this year which means we’ve had extra time to plan for Easter. Did you use the extra time? I did not. I totally forgot until just recently. In case you forgot too, I came up with the simplest Easter dinner that has ever been an Easter dinner. Why? You ask? Why is this the easiest Easter dinner in the history of Easter dinners? It cooks on one sheet pan in the oven for about 20 minutes. DONE. It leaves you plenty of time to egg hunt or go to church or do what ever else you like to do at Easter. Sleep in if you want. 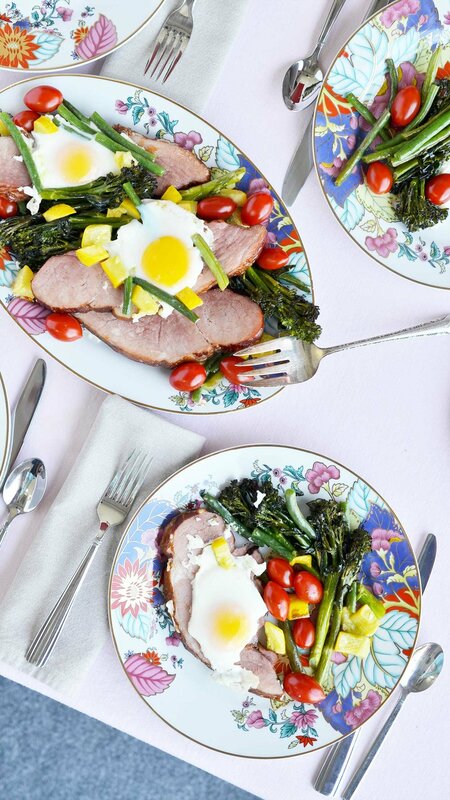 You’ll still get an epic Easter dinner on the table - or make it brunch. You do you. Just don’t forget the cocktail. Scroll to the bottom for this epic cucumber drink you won’t want to miss out on. Chop vegetables and toss with 2 tbs olive oil. Spread out vegetables on a cookie sheet. Slice the ham into one-inch slices and brush one side with 1 tbs peach jam. Snuggle the ham into the veggies and pop into the oven. Let roast for 15 minutes. Mix vegetable dressing by combining balsamic, remaining olive oil, mustard and remaining peach jam in a jar. Shake well and set aside. Remove sheet pan from the oven and make 4 small wells. Crack and egg into each well and sprinkle tomatoes on top of everything. Return the pan to the oven and cook about 5 minutes until the eggs are set. When everything is cooked, dress the vegetables and serve everything together. In a blender, puree the cucumbers until smooth. Press the puree through cheese cloth until all that remains is a smooth liquid. In a glass filled with ice, mix 2 ounces cucumber water with 2 ounces vodka. Top with club soda and garnish with a cucumber wheel. Watching the Oscars is so fun. So glamorous. So exciting to see who will win! I haven’t seen many of the movies - unless you count the animated series where I am literally rocking the category! It never seems to matter to me if I do know any of the movies; I love seeing the stars in their gowns, the beautiful jewelry, and all of the glitz. When Pearl was three I had the Oscars on and she came and sat beside me. She was enamored with the same things I am - the glitz, the glamour, the spectacle. Practically one minute into it, she declared “I’m going to be up there one day.” Who knows if that will ever be true. But isn’t that what we all dreamed of as a little girl? Getting to walk a red carpet in a stunning, custom made gown, loaded with gorgeous jewels and drinking champagne? It’s no movie star party without popcorn. All of the popcorn. I could literally make this my dinner. And I have - on occasion - made popcorn my dinner! This is the night to take popcorn up a notch with every mix-in you can find. There’s a simple way to host this party - make a popcorn bar! You can even do this for just your little family - the kids will think it’s a real kick. If you’re making this for the kids, then choose toppings that they will like. But if you’re doing it for a crowd, you can get a little more interesting and daring. Unless your kids are daring? Mine are not. Mine would pick only the candy and nothing salty or savory, but I cannot recommend enough adding bacon bits. And wasabi peas. And toasted pecans. OMG they are so good! What movies are you rooting for? I’ve only seen a few so I’m not really in for the movies. I’m in for the popcorn and the gowns. Tell me how you celebrate! Are you a fancy gowns type party person or a sweat pants type person? Can’t wait to hear! These are basically like Rice Krispie Treats but with popcorn which makes them delicious and - in my opinion - better than your basic Rice Krispie Treat. Sprinkled with a little salt over the top they are EPIC. There are no tricks, no secrets, etc. It’s just easy. In an air popper, pop the popcorn until totally popped. Let cool. In a pan, melt together butter and marshmallows over medium heat until totally melted. Combine the popped pop corn and the marshmallow mixture until totally coated. Spread in a greased 9x12 pan and pack in a little bit but don’t push too hard. You don’t want to break the popcorn. Let rest about 1 hour until cooled completely. Cut and serve. 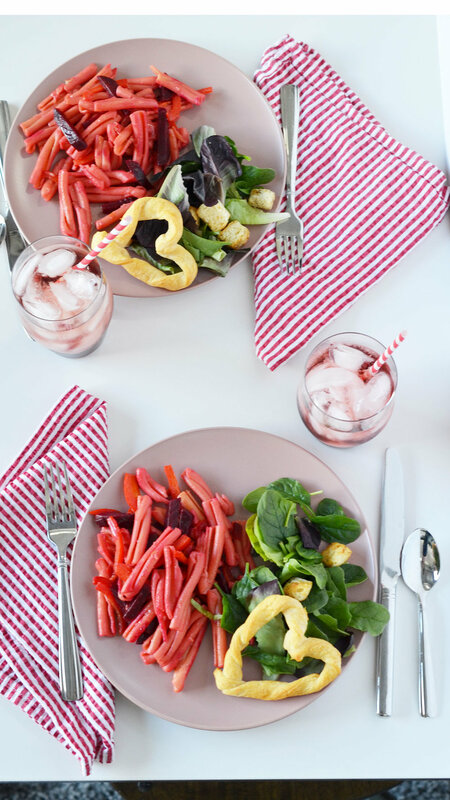 There are so many options for how to spend Valentine’s Day, but a fun way to celebrate with all of your friends is with a simple cocktail party - after all, Valentine’s Day is on a Thursday this year! Instead of celebrating just as couples, invite everyone over for drinks and small bites and celebrate together. This is especially great if some of your group is ‘coupled up’ and some of your group isn’t. And the planner-ahead-ers can pop over before their dinner reservation! I have found when you’re hosting a party that the best thing you can do for appetizers is pick three good ones and go ALL IN! So be prepared to make tons of them because no one will dig into a partially empty buffet. I usually make one batch of each of these per every 10 people. But if you are cheese lovers, then maybe add a little more. Preheat oven to 450 degrees. Place a bed of rosemary sprigs on a baking sheet and place the unwrapped wheel of cheese on top. Bake 30-35 minutes until the cheese browns on top. Remove from the oven and let cool 5 minutes. Move the cheese to a serving dish and discard the cooked rosemary branches. Drizzle the top with honey and sprinkle with walnuts. Serve with slices of bread or crackers. I found all of these serving platters at Anko - my new favorite obsession because everything is darling and really well priced. I picked up these pink platters because they’re pink but not PINK. I was friends with a guy who used to call PINK menopause pink because when he was growing up in the south, every woman around 50 years old remodeled her kitchen and added those pink appliances that were so hot for a while. It was the ‘60’s after all. Ever since then I have been super picky about my color pink. I DO NOT WANT menopause pink in my life. These are not. These are awesome. There are dinner plates and bowls too. Undoubtably the simplest appetizer you will ever make. Two ingredients; ten minutes; served hot or cold! In bowl, mix together the pesto and gorgonzola until evenly mixed. Spread on the top of toasted bread. Toast again for 2-3 minutes in a broiler - or serve cold. Delicious either way. Rub the edge of a champagne coupe with the slice of lemon and rim with poprocks. Pour in chambord and top with champagne. Serve quickly! I love combining new things with my collection of vintage barware. These champagne coupes are from the 1950’s and I adore them. I use them all the time because there is literally never a time when gold rimmed champagne coupes aren’t appropriate. If you can find some yourself, I highly encourage you to grab them! I set them on top of a marble board from Anko. I like to have everything grouped together - the marble is a great landing place for glassware ESPECIALLY if you have marble countertops. The slab creates a spot that’s unique but won’t damage your real marble counters in the event anyone spills.